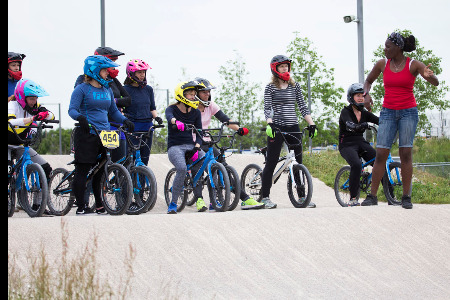 On 31 May 2017, thirty women aged between 21 and 55 tried out the Olympic Park BMX track in Stratford at Access Sport’s second ever BMXercise event. This popular event celebrating the BMXercise community around London got our BMXercisers together and gave them a new track to try out, while they gained new skills and confidence in their riding ability. The Olympic Park event also introduced 10 new riders to BMX! Most were brought along by enthusiastic friends who already attend the sessions. The two coaches, Sarah and Kelly, did a fantastic job of giving our experienced BMXers a workout as well as welcoming our new riders to the track. So what is BMXercise all about? Access Sport developed these BMX-based fitness sessions, designed for women looking to get more active. We run seven different sessions across London. Our relaxed, fun and friendly sessions are made to appeal to women who aren’t regularly taking part in physical activity. The idea behind BMXercise ties in with our overall aim at Access Sport: to engage people in sport who lie outside of traditional sporting demographics. In cycling, for example, the overall number of riders is increasing, but the number of women taking part has fallen. By creating an exercise session around BMXing rather than making the session competitive, we attract women who wouldn’t otherwise be engaged in sport. Of our current BMXercisers, almost 1 in 4 is over 40, 20% were inactive before starting the sessions, and the vast majority were brand new to BMX. “It’s a fantastic opportunity for ladies to have fun and get fit. I’m 51 and this project has really helped me to build stamina, get fitter and feel healthier overall,” one participant told me. Our inaugural sessions were in Southwark and Hammersmith, which Cycling Grants London helped us get up and running. New riders continue to join these popular sessions, adding to the core group who have been attending for over a year now. And we are continuing to grow! We’ve just introduced two brand new BMXercise sessions in Brixton and Merton, so we’ll be welcoming a new cohort of female BMXers into the family and hopefully encouraging more women to get active. So come and join us at one of our sessions! Bring your friends/mums/sisters/daughters to see what all the fuss is about, and find out why so many of our BMXercisers have said they wished they started sooner. All equipment is provided so you just need to wear comfortable, long-sleeved clothing!